Step right up to the greatest party on Earth! Who doesn’t love a trip to the circus? Peanuts, popcorn, and prizes are the name of the circus game, and kids never seem to tire of the spectacle. With a few circus party ideas in mind, we decided to try to bring a bit of the big top to HQ. It was a blast! Circus themed parties are excellent any time of year, whether you’re hosting your party in a big room or enjoying nice weather outside. From playing games to munching on animal crackers, we’re fair-ly certain that circus parties are a timeless classic sure to bring a smile both to the young and the young-at-heart. 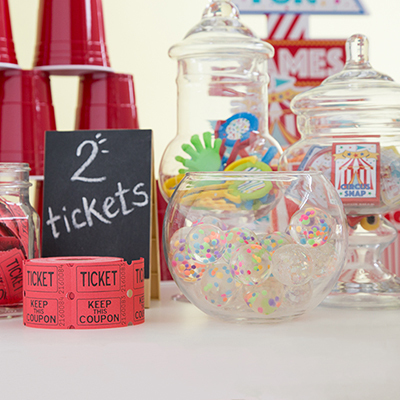 Circus parties and carnival games go together like cotton candy and funnel cake! Plus, they’re a great way for everyone to win cool prizes. We put together a few kid-friendly games that are fun to play and won’t empty your pocket. 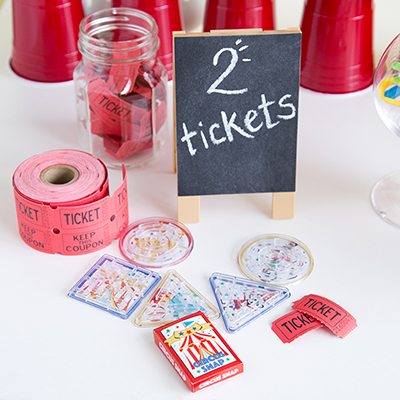 Take a look at our DIY circus party games below, and prepare to be amazed and entertained! 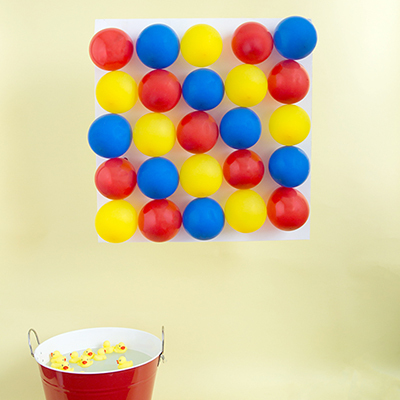 All you need is a Styrofoam board and a bag of balloons, and you can make your own balloon dart board! Inflate 5 rows of 5 small latex balloons and attach them to the board in any pattern you like. We picked stripes! There are 2 ways to play: You can hide tickets behind random balloons, or you can have players try to pop as many balloons as they can with a set of darts. Playing with actual darts requires adult supervision at all times. Otherwise, you can have younger guests pick 2-3 balloons to pop, and you can pop the balloons yourself to see if they win. It’s time to have a splash! 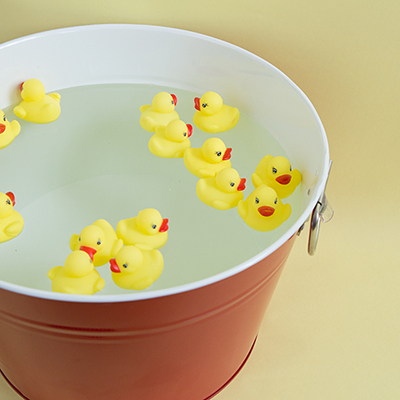 The duck pond requires a bucket, water, and a bunch of rubber ducks. Mark the bottom of each toy duck with a number ranging from 1-3. To play, kids will pick a duck from the “pond” – either by hand or with a net – and they win the number of tickets written on the bottom of their duck. Stack some cups then knock them down! This game is a real party-pleaser for anyone who likes to test their aim. Simply arrange any number of cups into a pyramid, then hand players a wiffle ball so they can take turns trying to knock down the cups from 5-10 feet away. Whoever knocks down all of the cups gets a ticket! When everyone’s done clownin’ around, it’s time for some snacks and prizes! 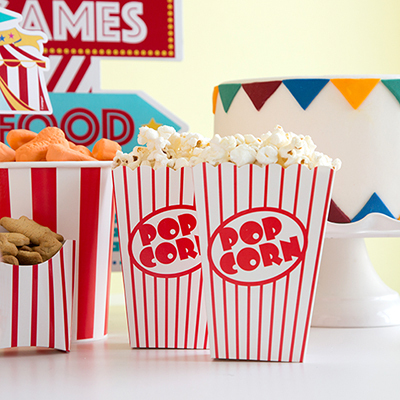 Help your partygoers get refueled with some popular circus delicacies like popcorn, french fries, and candy peanuts. 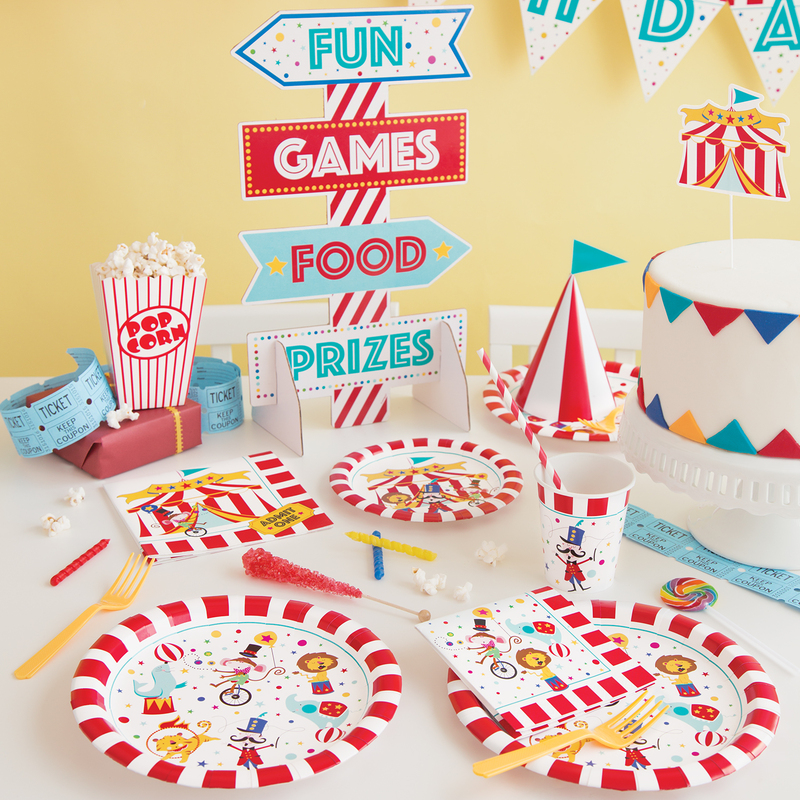 Our circus party tableware features cute cartoon graphics of a ringmaster and his talented friends, so you can count on your place settings looking extra fun. 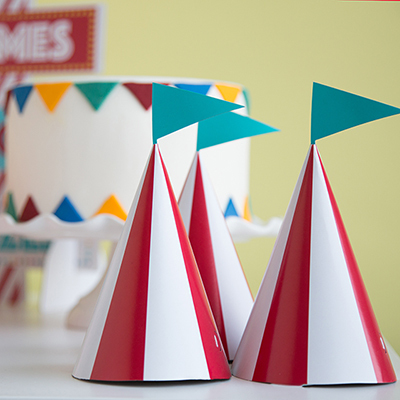 Similarly, our paper popcorn boxes and buckets are a terrific way to keep up with your circus party theme, and they’re made to hold big helpings. After everyone’s fed, take them to your prize station so they can trade in their tickets! We have lots of fun party favors you can sort into groups based on how many tickets they’re worth. You can find all these spectacular circus party supplies, decorations, and party favors online and at your local party store.